Lou talks about the cold opening and how he was invited to Skywalker Ranch to converse. Matt notices how strong Leela is when she lifts the couch that Fry and Bender occupy. Rich notes that Hermes says the "unspoken words" Star Trek. Matt realizes "doop" spelt upside down is "doop." Christopher mistakenly thinks it would be "pood." David remembers that type of word is called an ambigram and Lou calls it "awesome." Lou talks about the Amazonian woman coming back later in the series with an entire show about her kind. David forgets this is season 2 and thinks that episode was the previous one. "I am rightfully shamed." Ideas about the Neutral People. David apparently loves everything they say and how Zapp talks about them. David defines "Nimbus," Zapp's ship. Rich notes that complicated 2D animation often moves very fast. Rich says the animated explosion of the new DOOP headquarters could be his most favourite one ever. Lou questions the number of O.J. Simpson jokes in the show. Billy likes the Hyper-Chicken. He describes it as a Gerry Spence voice. Billy West does the Small Glurmo #1 voice and then does an impression of an analog alarm clock. Rich then asks Christopher to do a voice. There is a lawyer on staff, Patric Verrone, and he helped with the courtroom scenes. Matt always insists on having a squeaky shoe noise when it is possible. For quite some time, it was like every act ended with a sigh from Kiff. Davids comments on racking focus in a cartoon. Billy and David talk about what this montage is referencing, Midnight Cowboy. The commentators wonder why Hattie is rich. Matt believes an audience that hoots at all of the jokes would make for a good commentary. Lou suggests they do it and everybody commences hooting. 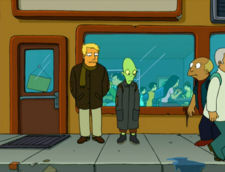 They hoot again when Zapp says "...service you sexually..."
David and Chris laugh at the SLAM button for the door. The room is silent for about 15 seconds before Lou says "We've totally run out of energy." Matt says this is because it's the fourth commentary they've recorded. Apparently, the first one they did was "gangbusters." Matt suggests they do a commentary on the commentary. Lou talks about the preposterous ship layout here. "It's an L-shaped Planet Express ship." Matt finds it strange that they deliver pillows. David tells a story about having genuine lead weights shipped to him from China. David talks about how Star Trek planets all have the same gravitational pull. Talk of a deleted scene where they reach the hotel and get a tip. David's favourite world record was always the world's largest coin. Jeffrey talks about Zapp's growing gut. David explains that a brig would be a waste of space on a delivery ship. Matt comments on the laundry (brig) room and how it's being used. David asks which character is doing their laundry. David explains Fry's "pancake" rant. Billy provided the improvised noises and Dwanye Carry Hill animated it. Dwayne was promoted to the position of director for that scene. The commentators point out and laugh at all of the Neutral jokes. They laugh at the handle on the back of Kif's suit. Bender's banjo used to be a French horn, but the writers remembered that he likes to play the banjo. Billy is confused as to how he can play a banjo with "105 pound hands." Lou attempts to remember a deleted scene related to the Neutral people. David X. Cohen: What is the name of those things? Ambigram, right? When a word you can look at a different way and it says the same thing. Lou Morton: I know what I call it: awesome. Billy West (as Zapp): [After Zapp blows up the new DOOP Headquarters] Oops, I did it again. Lou Morton: Thank you for buying our DVD. Billy West: Take 'em while you can get 'em. Big credits. Rich Moore: You don't get that on TV. This page was last edited on 11 December 2011, at 22:03.